Le Mans is back for 2018 and this year promises to be one of the most exciting races of recent times. If you’re looking for a way to watch all the Le Mans action then this is the guide for you. In this guide I’m going to show you how you can watch Le Mans 2018 for free from anywhere in the world. 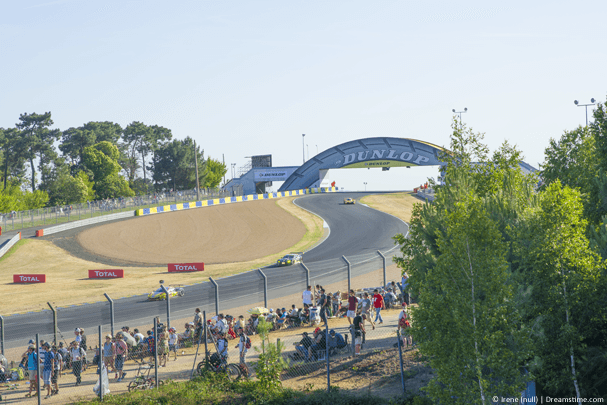 Le Mans or ‘The 24 Hours of Le Mans’ as it is otherwise known is one of the most exciting car racing events in the world but trying to watch it can be incredibly difficult. Around the world Le Mans is either reserved for expensive cable networks that you’re unlikely to have a subscription for or not shown at all in your country. The good news is, even if you don’t have access to cable you can still watch Le Mans 2018 in any country and below I’ll show you how. Around the world Le Mans 2018 is being shown mostly on subscription only cable services but in a few select countries the race is being shown for free. In the UK the network Quest is showing the majority of the Le Mans 2018 race live and it’s possible to watch this online. If you’re outside the UK then you’ll be blocked with a message like this below, however it’s possible to unblock this live stream easily. To unblock the Quest stream of Le Mans 2018 you’ll need to use an app called a VPN. A VPN works by allowing you to change your online location. Say for example you’re in the United States, your internet connection tells the Quest stream of Le Mans that you’re in the US. With a VPN you can make it appear as if you’re in the UK and so the result is the Le Mans stream on Quest is unblocked! This works from any country in the world such as Spain, France, Australia, Canada or anywhere else for that matter. Below I’ll show you where you can get a VPN to watch Le Mans 2018 and how to use it. To watch Le Mans 2018 anywhere in the world you’ll need to get a VPN app. A good VPN will cost you around US $10 per month (~£6) but obviously you’ll only need 1-month if you just want to watch Le Mans. 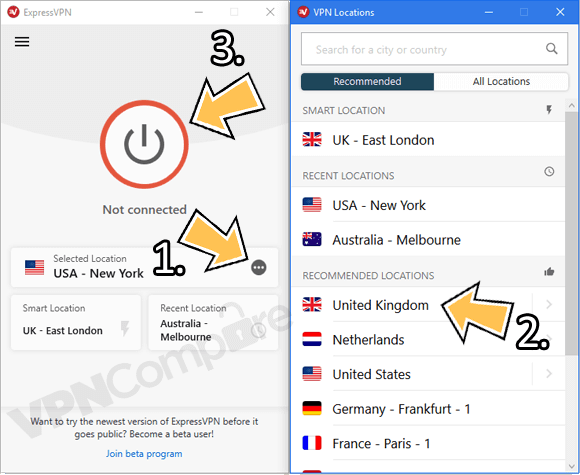 In the steps below I’m using ExpressVPN but you can use any of the three VPN providers above as the process is similar with all of them. Once signed up go to the Products section of the website and select and download the correct app for your type of device. From the My Account area of the ExpressVPN website copy the Activation Code. Install and open the ExpressVPN app and when required to enter the Activation Code. On some devices you may need to login with your email address and password which is the same as the ones you created when signing up. Press Choose Location (1.) then double click on United Kingdom (2.). The ExpressVPN app should start to make automatic connection for you but if it doesn’t, click the Connect (3.) button. After a few seconds the ExpressVPN app will let you know that it’s connected. All you need to do now is visit the TV Player Quest Live Stream. You can now watch the Quest live stream of Le Mans 2018 from any country in the world. When you’ve finished watching Le Mans, press Disconnect on the ExpressVPN app. You can of course use the same VPN service to watch other things while your subscription is active. Le Mans 2018 is set to take place on Saturday, 16th June 2018. Live coverage on Quest will be shown at the following times. UK Times. France +1 hour ahead. You can connect to the VPN app at the above times and watch the Le Mans 2018 coverage live. If you’re new to Le Mans then it’s one of the oldest car races in the world taking place in the town of Le Mans in France. It first started in 1923. The last three years have been won by German team Porsche with German Timo Bernhard and Kiwi drivers Brendon Hartley & Earl Bamber on the team. Prior to that the 5 years before were dominated by the Audi team and this year it’ll be interesting to see if Porsche can retain their crown and take 4 victories in a row. If you want to watch Le Mans 2018 and it’s on a cable network you don’t have access to or it’s not shown in your country then you’ll need to get a VPN app. You can get a VPN by clicking the button below, once you’ve got it connect to the UK and then you’ll be able to watch the action live on the Quest network for free.